The rest was indistinguishable due to the sheer volume of stuff—boxes, newspapers, empty cans, and dirty dishes. As we picked our way to the adjoining living room, we were forced to squeeze past a sullen teenager, who'd apparently just rolled out of bed and was slurping what appeared to be a bowl of milk. We didn't buy that house. Or even tour the rest of it. The kitchen is the nucleus of any house, and if it's not looking its best, every other part of the home seems icky, too. "Most buyers have a 5-second rule," explains Claire Groome, an agent with Warburg Realty in Manhattan. "If they walk into a [home] and don’t see themselves living there after 5 seconds, it’s not for them. How the kitchen looks is a very important part of that." Ashlie Roberson, an agent with Triplemint Real Estate in Manhattan, has encountered used dog potty pads splayed out in the middle of kitchens. But even that wasn't her scariest kitchen tale. The bottom line: If you want to throw a farewell bash, don't schedule it for the evening before you show the house. If you must, build in a cushion of cleaning time. And even if a litter box isn't front and center, seeing your feline friend roaming through the area where food is prepared and served might send potential buyers fleeing. 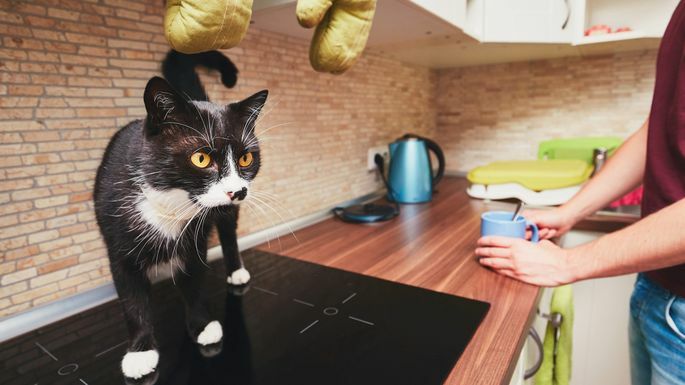 One of Groome's clients insisted on leaving a home showing when she saw cats lounging on the kitchen counter and open cans of wet, pungent cat food on the floor. "Due to the lack of space, this phenomenon is usually accompanied by a crowded sink—and buyers can't get past this," Stewart adds. While you might cohabitate just fine with your clutter, you're going to have to clear it—or chuck it—before you show your home. Remove everything from your kitchen counters, Stewart advises, and free up your sink. While you're at it, clear out the pantry of old foodstuffs, and remove magnets and photos from the refrigerator. If you're unsure whether something in your home is odd, let's be honest: It probably is. Find a temporary storage plan for your weird stuff before someone asks, "What the heck is that?" Now, no one's telling you to stop eating at home. But if you cook foods that cause a mess, “buyers will be too concerned about leaving with a smell on their clothes to properly consider your home,” Stewart says. Buy a Magic Eraser (or several) and go to town on the grease. Once your kitchen's sparkling, try to keep it that way. "Our clients actually kept stepping in the debris, it was that bad," Vosburgh says. Although the owners promised to get the pests under control ASAP, Vosburgh's clients didn't bite. "Most buyers know that if there's one bug or one mouse, there are likely many more," says Christy Murdock Edgar, a real estate agent in the Northern Virginia and Washington, DC, area. "Buyers don't want to find out that what they thought was one random cockroach is, in reality, a massive infestation." Pests are inevitably drawn to the kitchen. But if you're fighting the good fight, hide the evidence while showing your home. Stow away traps, poison, and bug sprays. Even better? Complete your campaign against the little critters before you open your kitchen to the public. Don't have the fortitude to clean your refrigerator coils or scrape old marinara off the inside of your microwave door? Hire a professional crew. That will ensure all your appliances get the deep clean they—and your potential buyers—deserve.